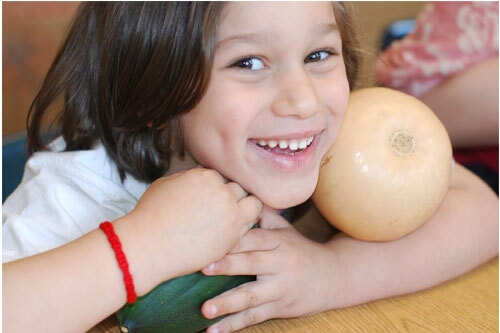 Way back in early April, when locally grown butternut squash was still available as a storage crop in Massachusetts, the Farm to School Team Made a visit to the Tynan School in South Boston to talk with students about the homemade soup on their plates. 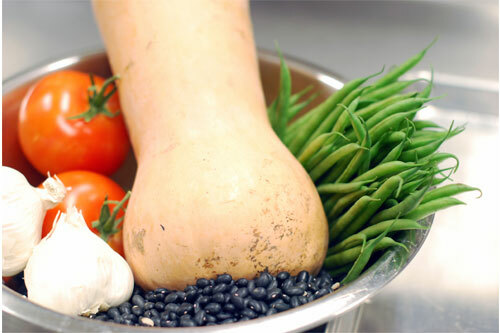 The soup featured butternut squash grown in Hadley, MA by farmer Joe Czjakowski, along with black beans, green beans, and corn in a cumin-spiked chicken broth. Packed with veggies and flavor, the Farm to School Initiative’s Southwest Vegetable Soup has been a hit with students across the district. 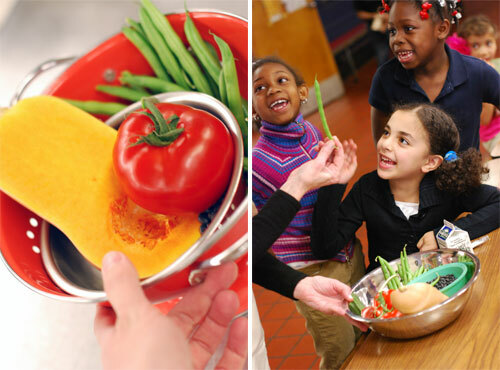 The soup has been featured as part of Boston Public Schools’ Local Lunch Thursdays, a program which puts local vegetables on the lunch menu at every cafeteria, every Thursday! This month, we’ll be featuring garlic-parsley roasted spring dug parsnips as well as local carrots (another storage crop) with ranch dressing. 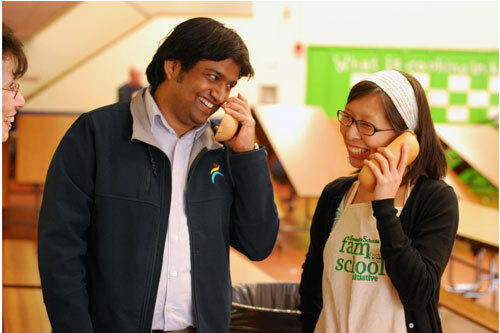 FNS Field Supervisor, Abhijit Potdar, & FNS Farm to School Coordinator, Kim Szeto talk squash. Needless to say, we had a blast at the Tynan School. 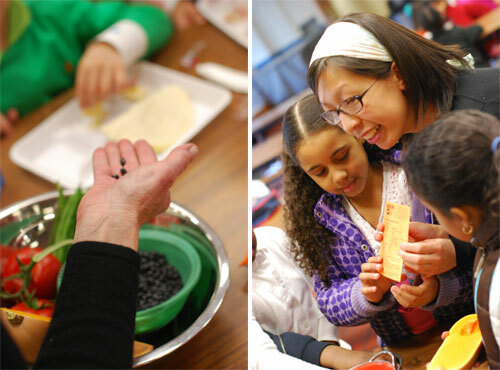 Students got a chance to see, touch, and learn about butternut squash. Kids, and staff (pictured above), used the butternut squash halves to “call the farmer” and thank him for growing such delicious veggies for lunch! Thanks to everyone at the Tynan, especially Cafeteria Manager Mayra Carrasquillo, for making Local Lunch Thursdays a success. 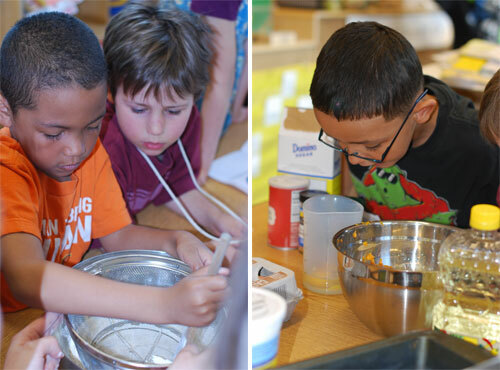 As part of the BPS Farm to School Initiative, the Department of Food & Nutrition Services’ Alexandra Emmott taught a baking class to the kindergarten and first grade students at Mission Hill K-8 in Roxbury. 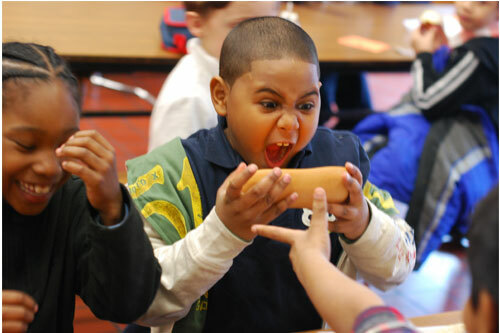 Students in the class were able to see and hold a variety of locally grown squashes and learn about the Massachusetts storage crops harvested in the fall and served on the lunch line all winter long. As part of an exercise in opening a bakery lead by teacher Kathy D’Andrea, students also got a chance to bake muffins using roasted and pureed butternut squash. The baking flexed kitchen skills, reading abilities, and basic math. And the muffins? Sweetly fragrant, tender-moist, and heartily kid approved! Preheat the oven to 350 degrees. Line a 12 cup muffin tin with paper liners or butter & flour. Whisk together the butternut squash, sugar, oil, and eggs. In a separate bowl, sift together the flour, baking powder, baking soda, cinnamon, cloves, nutmeg, and salt. Add the wet ingredients to the dry and mix until just combined. Divide the batter between the 12 muffin cups – about 1/4 cup each. The batter should fill the cups about 2/3 full. Sprinkle over the pepitas and bake until puffed and set about 20-25 minutes. Once cooked, a toothpick inserted into the center of the muffins should come out clean. Enjoy! 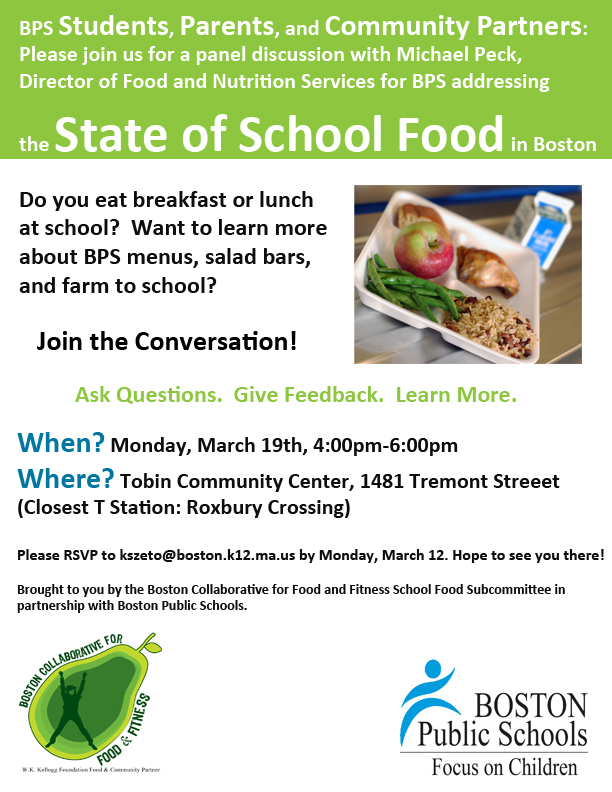 Monday, March 19th The Boston Collaborative for Food & Fitness (BCFF) in partnership with Boston Public Schools (BPS) hosted a panel discussion on the State ofSchool Food i nBoston. The panelists included Michael Peck, new Director of BPS Food & Nutrition Services; Shamil Mohammed, Deputy Director of BPS Food & Nutrition Services; Randy Davis, Regional Manager for Whitson’s Culinary Group (BPS’ satellite meal provider); Jennie Hall, Cafeteria Manager at East Boston High School; and Alexandra Emmott, Fresh Fruit & Vegetable Program Manager for BPS. The discussion was facilitated by Kim Szeto, Farm to School Coordinator for BPS, who co-chairs the BCFF School Food Subcommittee with Jose Masso, Project Manager for BCFF. The event was held at the Tobin Community Center in Roxbury and drew a diverse crowd of more than 50 attendees. The audience was primarily composed of high school aged students from across the city, representing a wide array of youth organizations and schools, as well as interested parents, teachers, and school administrators. 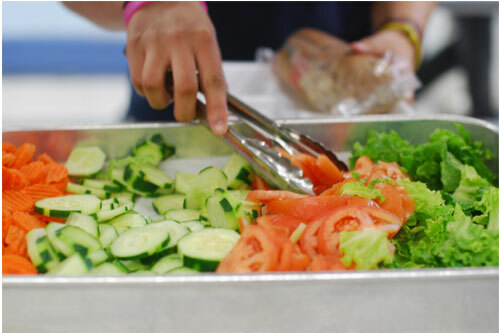 The panel discussed both Boston’s school food successes, such as the Farm to School Initiative, as well as challenges, such as short lunch periods and new Federal regulations. Audience members were then invited to ask questions of the panel which covered a wide range of topics including recent media coverage of “Pink Slime” beef, food waste, teacher meals, portion sizes, youth advocacy opportunities, vegetarian and vegan options, the cafeteria environment, and culturally appropriate school meals. The BPS Farm to School team used the panel event to debut and sample a new a la carte item – local carrots with homemade hummus – which we plan to pilot in two schools this spring. A la carte items are snacks or meals sold separately from the school breakfast and lunch program, such as potato chips. The crowd responded overwhelmingly positively to the carrots and hummus. In fact, we conducted a simple poll asking attendees what price they would pay for the package – responses ranged from $0.10 to $ 1.50 and averaged to $0.82. Look for carrots and hummus on the a la carte menu at East Boston High and Mission Hill K-8 next month, priced competitively at only $0.75! 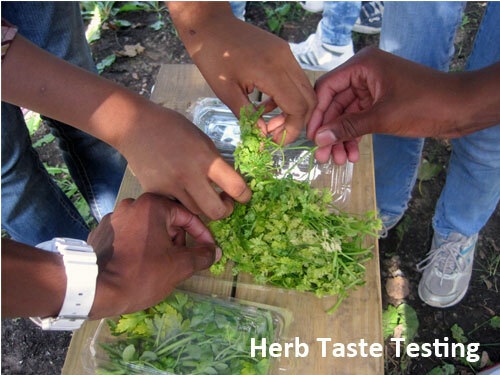 Fresh ingredients at the Lilla Frederick Middle School. Thanks to Jay Manoli and his entire staff for a great pot of soup! Lunch looks delicious at Brighton High! Thanks to Annie Yong and her staff for sending this photo. A hearty blend of squash, black beans, green beans and corn in a spiced tomato broth, the soup is served alongside a whole grain toasted cheese sandwich with milk and fresh fruit. 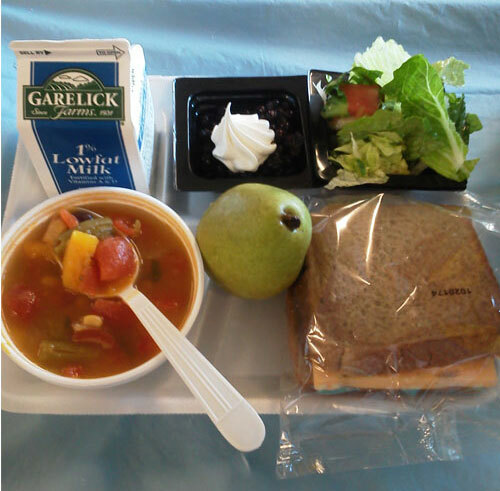 In case you missed it, the Southwest Vegetable Soup will be featured again on the BPS cafeteria menu Thursday March 1st. Can’t wait until March? Give the recipe below a whirl in your home kitchen. Heat a medium soup pot over medium heat. Add the oil and onion and sauté 1-2 minutes until soft and aromatic. Add the garlic, stock, tomatoes, chili powder and cumin. Bring to a boil, reduce the heat to medium-low and cook until the squash is tender – about 30 minutes. Add the green beans, corn, and black beans. Cook an additional 5 to 10 minutes just until everything is heated through. Season with salt and pepper, top with desired toppings, and serve. Sadie Richards, a FoodCorps Service Member, started with the Boston Public Schools’ Department of Food and Nutrition Services in late August 2011. 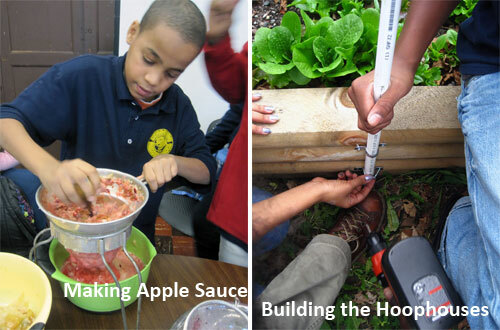 FoodCorps, a division of AmeriCorps, aims to reverse the trend of childhood obesity through engaging students in agriculture, educating students about food and nutrition, and facilitating student access to fresh fruits and vegetables grown by local farmers. Since August, Sadie has been working with the Farm to School Team at BPS and coordinating the Dearborn Middle School Garden, which was generously donated (and constructed!) by a team from Fidelity Investments. 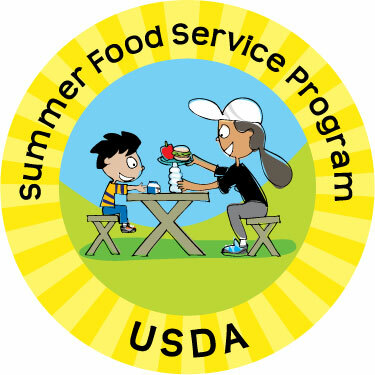 Sadie teaches a gardening activity block twice a week – Monday and Friday afternoons – during which she and her students do everything from garden maintenance and planting to taste-testing, food preservation, and composting. Thanks to the clever construction of protective plastic “hoophouses” (and our unusually mild winter weather), the Dearborn Garden is still green! 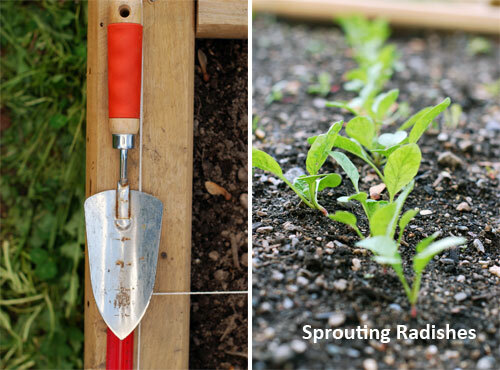 Growing under the white covers is a diverse mix of crops including radishes, kale, collard greens, lettuce, mustard greens, spinach, swiss chard, and pak choi. 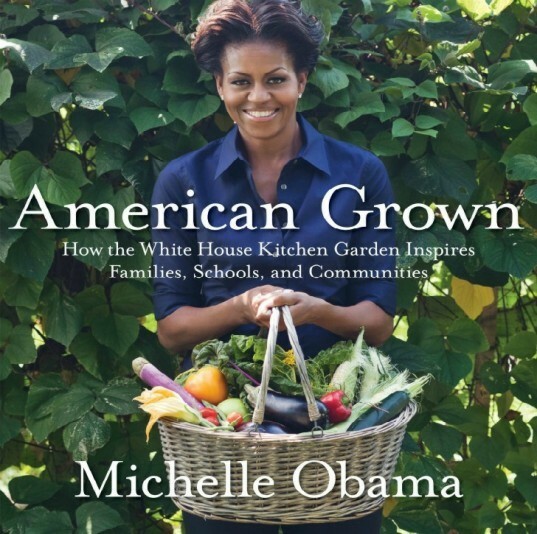 When they are not tending to the raised beds, Sadie leads her students in a variety of food and gardening lessons. For example, Andy Brooks, President and Founder of Bootstrap Compost, recently spoke to the group about his business, community benefits of composting, as well as the composting process in general. Sadie led the group in an interactive activity which explored the 5 kingdoms in compost and the life cycle. Later that week, students participated in a lunchtime collection of apple cores and orange peels for the school compost bin. In another recent workshop, Sadie’s students participated in a “pickle cook-off,” in which students tested two different recipes for pickled radishes. The exercise not only flexed their kitchen skills, but also required some basic multiplication and knowledge of fractions. What’s next for the Dearborn Garden? Sadie has plans for workshops in environmental and food justice, irrigation systems, and food and the media, as well as field trips to the Dudley Farmer’s Market, Boston Gardener, and Haley House. Best of all, warmer spring weather will mean more time with hands in the dirt!